Retiring Marshall Will Kane (Gary Cooper) insists on defending his town from a gang of hooligans who are due on the noon train -- but he faces the task alone as the cowardly townspeople flee like rats from a sinking ship. Director Fred Zinnemann creates an incredibly tense Western (rightly considered one of the true genre classics) that unfurls in real time -- as the clocks on the wall constantly remind us. Grace Kelly and Lloyd Bridges co-star. When I was a kid, pretty much all that I watched was old movies. 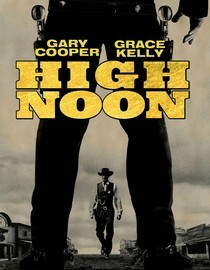 High Noon is one that I can distinctly remember watching on more than one occasion. I always liked this movie because Gary Cooper, who does a great job of playing the "ordinary guy," continues to stick to his decision of taking a stand against the villains, even though, one by one, the townspeople, who had just talked about how much they love him and owed him so much, would refuse to help him in his time of need. He was undaunted by their lack of loyalty, because he knew what was the right thing to do regardless of the outcome. So, he goes it alone, prepared to face these guys by himself. This brings me to another aspect of this movie that I really enjoy. As the events begin to unfold, as the description states, "in real time," we don't experience any amazing, no way that's possible, shootouts. Instead, we see a very believable guy with some believable villains facing off in a believable way. If you haven't watched a good old western lately, this is the one you should watch. And if nothing else, you will have the theme songs stuck in your head the rest of the day. If you have Netflix, click here.